This is a post written by Sarah Ann Taylor, a Leader in Me coach and consultant. 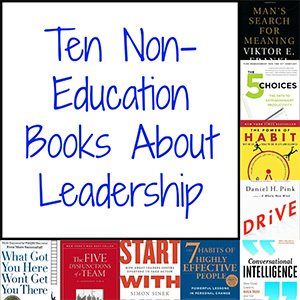 I recently received a request for some recommendations for non-education books on leadership. This request thrilled me! We become better models for the students we serve when we as practitioners commit ourselves to continual growth and learning. Below, you’ll find some of my favorite reads on leadership. #1: The 5 Choices: The Path to Extraordinary Productivity by Kory Kogon, Adam Merrill, and Leena Rinne. I often hear from teachers and others that time is a tremendous hurdle to effectiveness. I love this book for its practical insight on how to avoid distractions and give focused attention to highest priorities. #2: The Power of Habit: Why We Do What We Do in Life and Business by Charles Duhigg. While I am not quite finished with this book yet, I’d like to recommend it as a great addition to your library! It’s helped me to reflect on why my habits exist and how they function. I see Duhigg’s work applying to many areas of my life. #3: Bad Leadership: What It Is, How It Happens, Why It Matters by Barbara Kellerman. I read this book as part of my graduate-school work, and it was quite unlike any other book I’ve ever read on leadership. This book looks at the dark side of leadership and ineffective, leaders as well as the role of followers. #4: Conversational Intelligence: How Great Leaders Build Trust and Get Extraordinary Results by Judith E. Glaser. This book makes my list because at its core, it is all about trust. And y’all, trust is huge in leadership! #5: Man’s Search for Meaning by Viktor E. Frankl. Stephen Covey actually referenced this one in his works, and credited Frankl, in part, for Habit 1: Be Proactive® of the 7 Habits! In his memoir, Viktor Frankl shares from his personal experience descriptions of life in Nazi death camps. He argues that suffering is inevitable, but that we have choices in terms of how we choose our response to what happens to us, how we cope with suffering, find meaning in suffering, and move forward with intention and purpose. #6: The Five Dysfunctions of a Team: A Leadership Fable by Patrick Lencioni. I read this book as part of my work in Wake County and connected it to Professional Learning Community work. It’s a quick read that takes a look at absence of trust, fear of conflict, lack of commitment, avoidance of accountability, and inattention to results. #7: Start With Why: How Great Leaders Inspire Everyone to Take Action by Simon Sinek. You may have seen this TED Talk. If you have and you love it, keep the love alive with this book. I’ve made so many connections between Start With Why and Stephen Covey’s See-Do-Get model in The 7 Habits of Highly Effective People. #8: Drive: The Surprising Truth About What Motivates Us by Daniel H. Pink. Y’all, I’m a huge Daniel Pink fan. This one, which is all about motivation, is a fun read! Pink takes a look at the elements of true motivation: autonomy, mastery, and purpose. #9: What Got You Here Won’t Get You There by Marshall Goldsmith with Mark Reiter. I’ll be honest, I haven’t read this one yet. It’s been on an Amazon wish list of mine for a while. I’m interested in learning about the 20 bad habits he specifies as habits that stifle us personally and professionally. #10: The 7 Habits of Highly Effective People: Powerful Lessons in Personal Change by Stephen R. Covey. This is book gets a gold star recommendation from me. The 7 Habits in this book are relevant and helpful to everyone at every stage of life. What other books would you add to this list? Please share your suggestions with us on our Facebook and Twitter channels.